Stewart MacLean at the Halfway House c1957. Photo held: Ian MacLean collection. Stewart MacLean at the Halfway House. Photo: Marianne Haiselden, Karori, Wellington. Brett MacLean at the Halfway House. Photo: Marianne Haiselden, Karori, Wellington. Ian MacLean was born in Napier on the 16 August, 1928. 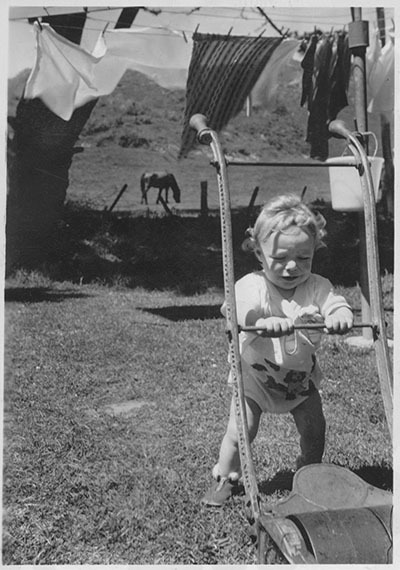 He was the first born son of Joseph MacLean (of Scottish ancestry, who migrated to New Zealand in 1909) and Lin Taplin, the granddaughter of George Allman who migrated to the gold fields of the West Coast at Kumara in the 1860’s. Ian’s parents met in Auckland. At the time, his mother had returned to New Zealand after service in World War I as a V.A.D. in the British Army and was working in a solicitor’s office. His father was working in an Auckland Post Office. Following their marriage, Joseph’s work in the Post Office resulted in the young couple moving to Napier. One of Ian’s earliest memories is as a little boy is associated with the Napier earthquake of 1931, when he was watching the roadmen putting the Napier roads back in order. The movement of the trucks and the loud clattering and excitement of steam roller was particularly memorable! Ian grew up in Napier, attended Napier Boys High School and then, as a 20 year old, moved to Wellington to study surveying. 1953 was a significant year. 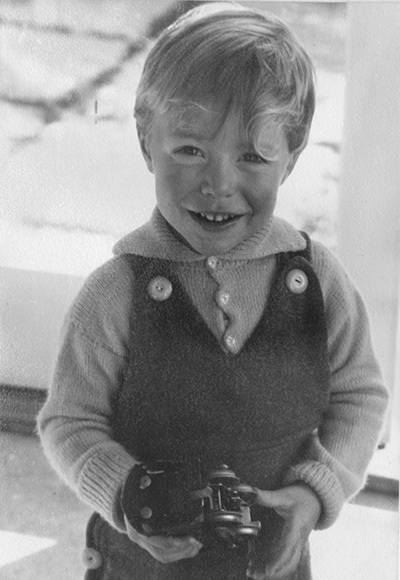 He obtained a surveying job with the Wellington City Council and married Pamela Burstall in Rotorua, whom he had met earlier, when working for the Lands and Survey Department on geodite work in Rotorua – Pam was the Department’s librarian. During the early years of their marriage, Ian and Pamela were renting a house in Days Bay, Eastbourne, when the owner gave notice of their impending return from overseas. The search for accommodation in a tight housing market began. Pamela was friends with Daphne John, who was living at the Halfway House, and spoke to her about their predicament. The John’s told them that the Richardson family who rented the back of the Halfway House, were moving out. Ian contacted Johnny Jenkins, the City Valuer for WCC, and the deal was done. The MacLean’ s could rent part of the house when the Richardson’s moved out. The move was officially made in January 1956. 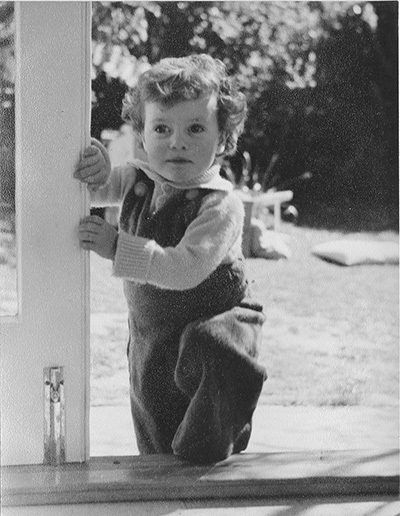 “Unbeknownst to us, when we made the move my wife was pregnant with our first-born son, Stewart,” said Ian. Stewart was born in September, 1956. He was followed by Brett, born in January 1958. Both boys had their formative years living in Glenside. Ian describes the house as it was in 1956. “We called it the Halfway House and I never knew it by any other name,” he said. “The entrance is the same as it is today, driving up a gravel road from the main road. On the right of the entrance was a house occupied by the Glass-Johnson’s. The Hughes (jokingly known by the community as the Chrystal Hughes) lived next to them. Their properties were fenced.
" Further up the drive on the right was a big long shed. It was about 30 foot long and open on one side. We kept the car there, a 1939 508c Fiat, 1100 cc. I had rebuilt it and it was painted bright red, although the original colour, when I bought it, was bright blue. “Between the shed and the porch of the house was our vegetable garden. We had the usual vegetables, lettuce, silver beet, peas, however what grew very well, were the strawberries. We would get a magnificent crop of strawberries. We kept beehives. “The house lawn sloped down to the creek and beyond the lawn were gooseberries and red currants. It was a nice flowing creek. Across the creek you could see the Tulloch’s house. It was a very big two-storied handsome house. Well built. “Our Muscovy ducks loved the creek. We would get six eggs every night from the ducks. Sometimes they would go broody and we would get calls from people up and down the stream asking us to come and get our ducks. When they produced ducklings, you would see 12 to 14 ducklings accompanying their mother up and down the stream. “The gravel drive continued past the back of the house and there was a fence and it opened out through a gate into a large paddock. Between the house and this paddock was a lovely sunny sheltered grassy area and that is where our boys played a lot. This area had the septic tank. It was a very big septic tank with a timber top. “I don’t recall there being a house or anything like that up the hill directly behind the Halfway House. I do remember that there had once been a golf course in these paddocks and up at the top of the hill behind the Halfway House there was quite a nice paddock and I could identify it as one of the greens. “We rented the 28 acres and had horses, chooks and ducks and grazed three or four milking cows. There was a milking shed that I built, just through the gate beyond the house. “There were plenty of youngsters about as Pam was a horse person and taught riding and there were lots of children coming and going. Pamela also had a small Arabian stallion which she bred from and there was horse trading. “It was a bit of a shambles inside. You would come in from the back door. Downstairs on the left, as you came in the back door, was the kitchen with an old coal range. An annex had been built off the ‘motorway end’ (the eastern end) of the house which housed a bathroom and wash house. “The room on the right of the back entrance was a lounge or study room. I lined it with pinex and painted and carpeted it. It was a nice little room and in winter we lit the fire and it was nice and warm. The children slept in a little porch off this room. “Our bedroom was upstairs and when the children were older, I wired an intercom in so that we could talk to each other, but more so that Pam and I could hear any disturbances downstairs. We had two bedrooms upstairs on the western side of the upstairs bathroom and Olaf and Daphne had the other two, on the east. “We didn’t really explore around Glenside environs as we were busy with the work, the young boys and the animals. Generally, the order of the day was that Pam would drive me into Johnsonville Railway Station and I would catch the train into work, leaving her the car for the day. Eventually my work took me to Linton, in the Manawatu, and in January 1961 we made the move north. In 1963 we moved from Linton back to Wellington and I ran a small private surveying and engineering practice from Newlands Road. I joined the Vintage Car Club and as a hobby restored vintage cars. As a family, we motored in them extensively around New Zealand. Pam wrote a book called ‘The Veteran Years of New Zealand Motoring’ which was published just before her death in 1972. My wife died at the young age of 40 and I remarried in 1973 and moved to Crofton Downs. I worked for Wellington City Council in 1976 until 1989, when I again went free-lance doing private work, which I continue to this day in 2019. It is interesting to see the Halfway House full restored. To us as newlyweds and new parents it was a haven – cheap rent – loads of space – a garage and workshop and land for Pam to run her farming and equestrian enterprises from. It was a pity Olaf and Daph didn’t stay long as when they moved from the Halfway House in 1956 they were followed by a procession of indifferent neighbours. Olaf John (age 94) and myself (age 90) are now living in Crofton Downs, Wellington, not far from each other.